How many rooms can it cool? Is it noisy to operate? Which brand has the most reliable and affordable products? In many areas of the United States, homeowners experience a very wide range of temperatures throughout the year. Northern states have frigid winters that demand high-powered heating systems. Texas is blessed with more moderate winters. For much of the year, heating a home is easy. On the other hand, summer months bring long periods of high temperatures. That’s why many homes in the Houston area, the Dallas and Fort Worth metros and in San Antonio are equipped with electric heating that uses electric furnaces, wall heaters or strip heating. In those homes, no air ducts are available for a central air conditioning system installation. When considering a ductless AC or heat pump system for your home, the cost of your investment can vary quite a bit. When you ask a contractor for a price quote, a representative will discuss all of the factors that affect cost with you. The total will depend on how many rooms you want to cool, what brand and model of system you will select, and a number of other considerations. You should expect to get more than one price quote for different options. We provide useful information that will help you evaluate those quotes and make an informed decision. The number of companies that manufacture ductless air conditioner and heat pumps has increased dramatically. Most brands are familiar to Texas consumers, including Daikin Goodman, LG, Mitsubishi, Carrier Toshiba, and Fujitsu. New brands are also emerging, including Haier. All are available from the Texas HVAC and AC contractors listed on this website. By comparing features, warranties and models from multiple manufacturers, you’re sure to find a system that is an ideal match for your needs and budget. You’ll find detailed information at the link above to help you do your own research and get the facts you need. Central air conditioning works with your furnace and air ducts to deliver cool air throughout your home. An exterior compressor and condenser unit works with an evaporator coil in your ductwork and air-handling blower. It can’t work without air ducts. Ductless mini-split systems also have an exterior condenser and compressor, very compact in size. 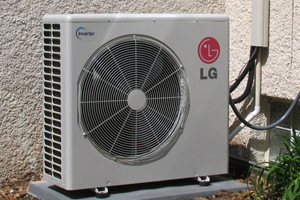 It connects to one or more compact indoor units, typically wall-mounted, through refrigerant tubing. The indoor units contain an evaporator coil and an almost silent fan, delivering cool air to one room or multiple rooms. No air ducts are needed, and you control the temperature precisely with a small hand-held remote control. If you only need to cool one area of your home, an affordable single-zone system is a great way to replace a noisy, ugly window unit. Easily installed by a local Texas AC contractor, it will deliver outstanding cool comfort at a very reasonable cost. To cool multiple rooms or zones, a single outdoor compressor can serve up to eight indoor air handlers, each connected with easily concealed refrigerant tubing and wiring. Each room’s temperature can be controlled separately. Many Texas homeowners replace multiple window units with one high-efficiency ductless system and enjoy great energy bill savings. Heat pump versions of these systems can also cut heating bills. Since ductless air conditioners don’t waste energy through heat loss in air ducts, they can be much more efficient to operate than typical central air conditioning systems. With SEER ratings as high as 23, and the ability to control temperature separately in individual zones, the savings on energy bills can be significant. Compared to inefficient window units, the savings are even higher. Over time, those savings more than compensate for the initial purchase and installation cost. Super quiet operation is another advantage that makes this new technology a terrific lifestyle choice in home comfort. It’s no wonder that more and more people are making the switch. In the long, hot summer season, having a reliable, energy-efficient home-cooling system is critical for bringing your family comfort. When you need a new or replacement AC equipment installation, finding the right contractor can save you time, money and headaches. There are hundreds of mini-split systems dealers to choose from across Texas, from Flower Mound, Waxahachie and Forney to Carrollton, Irving and Rowlett in the Dallas Fort Worth area, from Fair Oaks Ranch, Jourdanton and Geronimo to Frio Town, New Braunfels and Leming in the San Antonio area, and from Pearland, Meadow’s Place and Highlands to Hillcrest, Cypress and Stafford in the Houston area. You can find a wide range of products and pricing offered by different dealers. Should you consider a ductless mini-split AC or heat pump system for your home? If you have a home that lacks the central air ducts, then the answer is probably yes. At a very affordable initial cost, your local residential air conditioning company can supply and install a single-zone or multi-zone system to match any home. You’ll get rid of bulky, noisy window units, enjoy better cooling and save plenty on your energy bills. Opt for heat pump technology, and you can save even more. Learn more on this website, and then call a local contractor for detailed estimates and additional information.